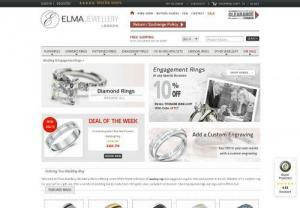 Since 1982, Elma Jewellery has been committed to offering quality wedding jewellery for men and women at affordable prices. Based in London, we want to be your first choice for your wedding bands and engagement rings, and all of your jewellery purchases in the UK. Whether you're shopping for a birthday, anniversary, holiday, you'll find our prices and customer service unrivaled.